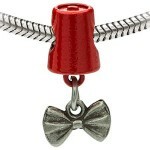 There is a little Weeping Angel as a dangling charm for a charm bracelet. If you are looking for a nice Doctor Who themed charm for you charm bracelet then you are in luck as this Weeping Angel is one you should have. This Doctor Who charm will fit all the mayor brands of charm bracelets like PANDORA, Chamilia, Biagi and Trol and if you don’t have a bracelet yet then no worries as this charm can come with it’s own bracelet if you need one. 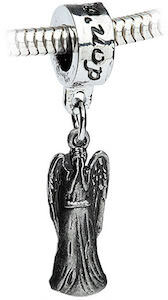 The Weeping Angel charm is a dangle charm that looks just like the real angels as seen in the Doctor Who episodes. And this dangling Angel is connected to a bail that says “Don’t Blink” on it. If you are looking for a special Doctor Who gift or just want an amazing charm then you have to check out this Doctor Who Weeping Angel Charm Bracelet.